In a world obsessed with getting more done. achieving more and chasing success we often lose sight of the importance of taking time to refresh and recharge. This is where regular resets come in. Resets are, as the name suggests, time for us to reset ourselves in some way. This can be physical, it can be mental or it can be a combination of both. When we talk of resetting and recharging, many of us will think of travels to far off lands and extended time away from work and our day to day lives. 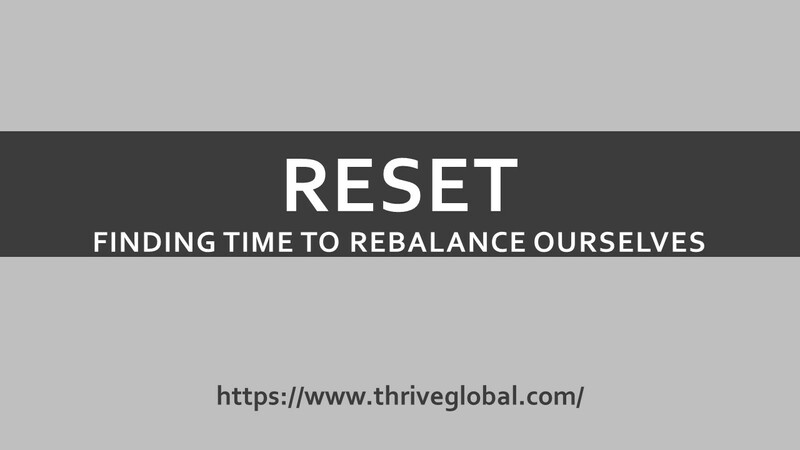 That’s one type of reset but there are others that are more accessible to us on a more regular basis. Here of 4 core resets that we should all be making some time for. So simple, so obvious but how many of us actually make rest the priority it deserves to be in our lives? In our busy and rushed times, restoration can suffer in our attempts to squeeze more and more into our lives. This, no doubt, has a lot to do with why burnout and stress are on the rise. We need to prioritise rest as well as action in our lives. Both have a Yin and Yang relationship that we must do our best to balance if we are to live well. How do we prioritise rest? We can get into a regular sleeping habit and make sure we’re waking up feeling refreshed and rested most of the time. For restoration – massages, spas, a little pampering all count but so does just putting your feet up for some ‘me’ time. The message is clear, we need to take our rest seriously. Days spent hunched over laptops cause tightening in our muscles. The aging process can also make us much tighter than we used to be. Aches and pains appear where there were previously none. We can alleviate these problems by making time to stretch. This doesn’t have to be too complicated and can be as simple as just making space for some regular and quick basic stretches throughout our day. It could also mean having designated sessions of more formalised stretching via Yoga, Pilates or something else. I love to walk. I love to walk early in the morning as the day is breaking or later in the day as the sun starts to set. I like to walk to get somewhere and sometimes I just like to walk for the sheer joy of the walk itself. I like to walk with a companion or two and other times I love to walk alone. At its best a long walk can feel like moving meditation. The ultimate reset. It blows away mental cobwebs. It refreshes and rejuvenates tired minds. It provides stimulus and fertile ground for new ideas. Complex problems we’ve been struggling with suddenly fall into place. There truly is something magical about a good walk. Mindfulness might be one of those words that makes some of us nervous as it feels a little woo woo. All it really means is taking the time to get in touch with our own head space and thoughts. It’s just cutting out the external world and noise for a while and tuning into frequency us. It’s time for us to disconnect a little from the world around us to reconnect with ourselves. Mobility, the degree to which we can move freely without discomfort, along with strength and health are perhaps three of the most important functions that can add life to our years. Mobility is distinct from stretching. Stretching is often static and passive in nature, mobility is not. It’s moving, it’s about keeping our joints and ligaments well oiled and practised in movement. As well as the other resets, we can also make time for regular mobility work in our lives. We can build mini-mobility sessions into our days or set aside designated time for more involved work. Certain forms of exercise (full range strength training, climbing steps two at a time) are even a form of mobility work in themselves. Let’s do our best to stay mobile. Resets are a necessary part of our lives. Quietness and calm can come to a busy mind. A new outlook can present itself. A tired body can feel reinvigorated. A stiff and tight body can become lithe and adaptable again. Resets don’t have to be complicated or time consuming to be effective. In fact, the simplest of resets can often add the most value and stand the most chance of becoming habit. Make time for regular resets and reap the many benefits. Is It Time to Get Out of Your Own Way?